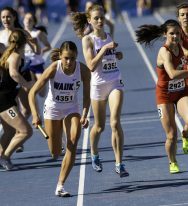 Waukee High School (WHS) Boys’ and Girls’ track teams enjoyed great weather and success at the 109th running of the Drake Relays. Highlighted by relay victories in the boys 4×400 meter relay and the girls 4×800 meter relay and an individual champion in the 100-meter hurdles, WHS brought home a combined 35 medals between the boys and girls programs. The boys 4×400 team of Nolan Roethler, Aaron McCrary, Sam Yeaway and Zach Eaton won in a time of 3:18.77. It was the second 4×400 Drake victory for WHS and the second-fastest time in school history. Nolan Roethler placed second in the 400 hurdles and Owen Minshall placed third in the High Jump. In addition, the shuttle hurdle relay team of Roethler, Jackson Payne, Asher Hutchison, and Tyler Williams continued WHS’s tradition of hurdle success with a third-place finish. On Friday morning, Sydney Winger raced to a new Drake Relays record in the prelims of the 100-meter hurdles with a time of 14.19. She went on to win the final in the afternoon. Kat Moody battled through an injury to place second in the shot put, an event she won last year. As usual, the WHS girls excelled in the relay events. The girls 4×800 team of Lily Campbell, Jessica Caraway, Sydney Schaffer and Logan Akason were victorious in a time of 9:15.60. The Shuttle Hurdle relay crossed the finish line first, running the fourth fastest time in state history, but were disqualified for an exchange violation. The girls were also second in the 4×200 meter relay and got third place finishes in the 4×100, 4×400, and Sprint Medley Relays. Because of their success in the relay events, WHS girls won the Drake Relays HyVee Relay Cup, an award the boys’ team won last year.